I didn’t know that about bagpipes. How interesting! The video was cool. Thanks. Now, I want to play bagpipes. What I find very amazing is that I didn’t read that many B blogs today and this is the second one I’ve read about bagpipes! What are the odds? Come on! Surely there are many, many B words. But oh, those bagpipes! I’ve always loved the bagpipes, but always associated them with Scotland or Ireland. I was not aware of their broad range. Enjoyed today’s blog! Shared that one on my FB. Bagpipes sure go all around the continent, it seems. Not sure I’m too crazy about the sound, though. 🙂 Okay, maybe once a year or so. No matter where they’re played, the sound of bagpipes stirs the soul. At least mine it does. Visiting from the A-Z today…good luck with the challenge! 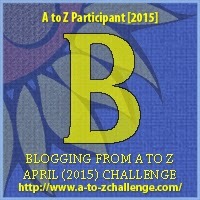 Bagpipes will appear in my A to Z, but not till N! Other parts of the UK have other forms of bagpipes, e.g. Northumbrian pipes. I think of a trip to the beach a few years ago, where far off in the distance we heard bagpipes and wondered what the occasion was–or, if there WAS an occasion. Great post! Thanks, Sabina – how lovely! It does seem to be an “occasion” sort of instrument, doesn’t it? It really does! Same with harps, I think. Whenever I think bagpipes I think of the time we had to sing Amazing Grace and then the bagpipes came in for a wedding. Main problem bagpipes are very loud in a confined space :). I have never seen a bagpipe flashmob before. You’re right, they can be loud – and piercing – in a confined space. Better to play them outdoors! Always informative! Thanks for broadening my musical perspective. Sadly, my first association is with funerals. Amazing Grace. Yes, exactly, Sharon. Nice to find some joy in this music, too. Guess I’m one of those who associated them only with Scotland. I learn something new everyday. Denise! I’ve learned a lot as I created these blog posts. Thanks for stopping by. Thank you – for me as well. Bagpipes always sound so cool. I like that they’re making a comeback, but didn’t know they’d been used in other countries! Neat! I didn’t know that either, I am happy to find that out! Great post! Same — I had no idea! Beautiful and haunting! Bagpipers always have the same effect on me but this one is special.